“We have been given so much in our ministry, Herman and I just want to give back to the Lord what He has blessed us with,” stated Cynthia Nells. So goes the overriding sentiment behind the missionary work of Herman and Cynthia Nells, a Navajo couple ministering to the First Nations people in Canada. I met with Herman and Cynthia at Solomon’s Porch, the café at Calvary of Albuquerque. The Nells were in town to visit their children, share of their ministry, and visit friends and family for the holidays. 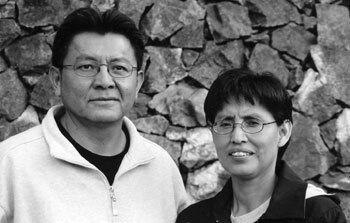 The Nells are members of the Navajo people and served as pastors on the Ramah Navajo Reservation, a group south of Gallup, New Mexico and east of the Zuni Reservation in western New Mexico; though Herman and Cynthia are originally from Dilkon, Arizona. Herman was the senior pastor of the Ramah Nazarene Church for over 12 years before he and his wife were called to Canada as missionaries. In Canada, The Nells minister in a city named Port Alberni on Vancouver Island, a tiny island off British Columbia. There, Herman is a chaplain at the local hospital. I asked Herman and Cynthia about the move. “We felt called as missionaries in January of 2007. I had returned from a men’s conference and felt the Lord tugging at my heart. We ended up leaving Ramah, New Mexico in February 2008,” Herman told me. “At first I didn’t know what to do. We just obeyed the call and left. Now, I am ministering as a chaplain at a hospital. The Lord has opened up some great ministry opportunities,” Herman continued. I asked Herman and Cynthia about some of the biggest obstacles. “Probably the greatest obstacle is the havoc that the Eurocentric people imposed upon the First Nations peoples. There is a lot of animosity and anger against the European culture,” stated Herman. “Of particular interest is what is called the Canadian Genocide,” Herman said. The Canadian Genocide was a series of events where the Canadian government imposed upon the First Nations People western ideals. These included residential schools, government land grants, the state church, etc., with many, many First Nations People dying and being persecuted. “It is a sore, sore subject in this region of Canada,” he finished. The people in the region are known as the Nuu-cha-nuulth. The Nuu-cha-nuulth are composed of 14 bands of First Nations people. The largest band runs around 2,500 individuals, and the smallest band has less than 100 people. I then asked Cynthia and Herman about some of the blessings they’ve experienced. I asked both Herman and Cynthia about some of the struggles they’ve faced as missionaries. I asked the two of them how this was so. “Our family is about ministry — giving back and showing God’s love. Our Native churches have received so much from the work and witness teams over the years that we wanted to begin giving back by helping other churches in need. Our efforts in Canada are just an extension of what the Nells family stands for,” Herman finished. With this, I thanked Cynthia and Herman for sharing their inspiring story with me. We shook hands and I left, realizing I had gained a deeper appreciation of the beauty of the body of Christ. For truly there are no walls that separate those who are in His love. No ethnic, racial, or gender separations — we are all one in Christ. Brian Nixon is a pastor, writer, musician, and family man. He currently lives in Albuquerque, New Mexico.